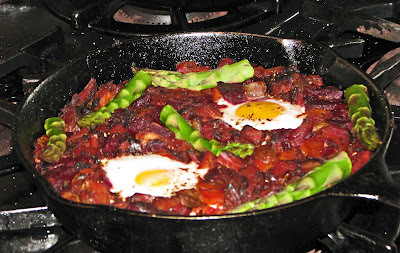 Leftover corned beef is on the skillet today. 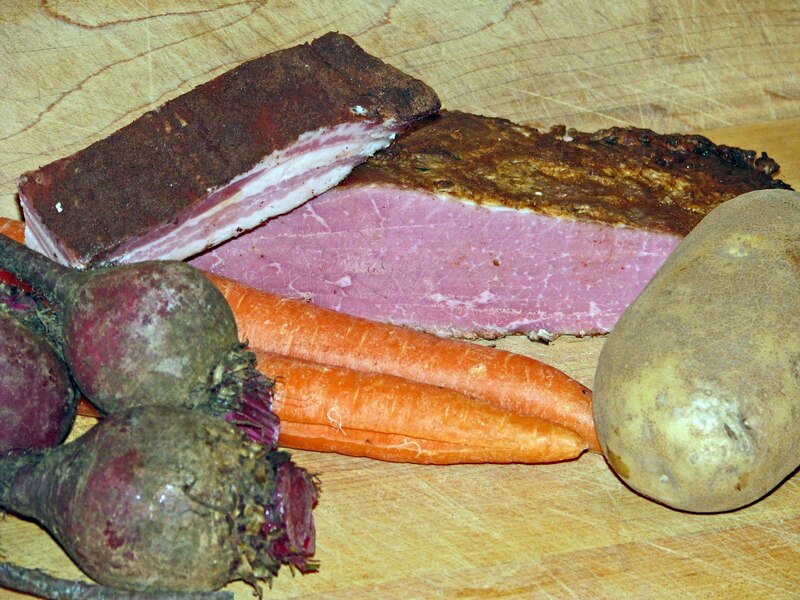 A combination of corned beef, potatoes and roasted beets will make our ''Red Flannel Hash' yummylicious. Do you follow recipes to the letter? A friend of ours from Marin who sometime is “I’m Mad and I Eat” likes to list ingredients and offer vague instructions: ( for example: A Liberal sprinkling of this and a Conservative splash of that with a touch of Green will not harm the Peace & Freedom of your dish.) I like to think of recipes as an outline that you can add or subtract with your own personnel twist. Today’s recipe will be vague but fun. Think of your 10 inch cast iron skillet as a measuring cup. We are going to fill it up with ingredients. You then can add your own variety of spices and flavors. Optional: salsa, Worcestershire hot sauce, oregano, cumin, garlic parsley asparagus, eggs and anything else you can imagine. Render your bacon for fat and flavor; fill up pan with rest of ingredients and simmer on low heat. Turn several times until potatoes and carrots become tender. Turn up heat slightly to form crust on bottom. Turn one more time and add optional eggs. Cover until eggs are cooked. I know these instructions are vague. Give it a try. Cooking is fun. Go out and create some Red Flannel Hash. You won/t be sorry! That was one of Dad's favorites. He used to make it for his Men's Prayer Breakfast group at his church and they all liked it too. I remember. I think I originaly got the recipe from a Sunset cookbook. I made it for Dad and he brought it to the prayer group. One cup of "bravo" from the vague Marin hippie! cookiecrumb, You are our favorite vague Marin hippie. Hope to see you at the market Sunday. We need to get our asparagus fix.